You may view our extensive range of engraved, customized or keepsake urns at your leisure by visiting our Products section or Contact a Carnell’s Funeral Director for personal service. Cremation is a technical heating process, which reduces the human body to its basic elements primarily bone fragments and particles, collectively referred to as “cremated remains”. They are not “ashes” as commonly referred to by the public. The cremation process begins with the placement of the casket or container into the cremation chamber where it is subjected to intense heat and flame, reaching temperatures as high as 1800 degrees Fahrenheit (1000 degrees centigrade). The time it takes to complete a cremation varies with the size and weight of the deceased, but usually takes between two and three hours. This is followed by a cooling period of three to four hours. The basic elements remaining after cremation also depend upon the dimensions of the deceased, but generally weigh between four and eight pounds. Following the cooling period, the remains are swept or raked from the cremation chamber. Once separated from any non-combustible materials, the bone fragments may be further reduced by mechanical means to uniform particles for placement in an urn or similar sturdy container. The cremation process takes place inside a cremation chamber constructed to withstand intense heat and flame, reaching temperatures as high as 1800° Fahrenheit (1000° Centigrade). The inside of the chamber is lined on both sides with a heavy refractory brick or tile, while the floor and ceiling ressts are made of concrete. The floor, which is approximately 6 inches thick, is supported by a heavy metal plate, and the ceiling resets on the sidewalls. A layer of insulation is placed between the refractory and the outside protective housing. There are several types of cremation chambers manufactured. Generally, they are made of high-grade steel plate and include a variety of automatic controls. Most use gas or oil for heating. The structure that houses the cremation chamber is called the crematory or crematorium. It can be a building that serves this one function or part of a multi-purpose facility such as a funeral home or chapel. Modern fireproofing, noise barriers and environmental protection devices are built into the chambers to ensure problem-free operations within any area. Before cremation can begin, all authorization forms must be completed and signed. This includes obtaining important information and reviewing the crematory’s rules, regulations and procedures. A heart pacemaker or other implanted mechanical, prosthetic or radioactive device can explode during cremation causing significant damage to the crematorium and injury to staff. As a preventive measure, the funeral director must determine if the deceased had any of these surgical implants so that they may be removed. Recently concern has been raised over the potential exposure that funeral home and crematory personnel may encounter with decedents who have been treated with nuclear medicines or received brachytherapy treatment. This treatment involves the implantation of radioactive seeds. The rupture of certain types of radioactive seeds during the actual cremation or during the processing of the cremated remains could result in a significant release of radiation in a relatively confined area. Depending on the type of seed and its half-life the funeral director must determine if the seeds should be removed or the cremation delayed until the seeds are rendered inactive. Confirmation of whether the deceased died of an infectious or contagious disease is also information needed by the funeral director to ensure the necessary precautions are taken. Without definitive knowledge of the deceased’s medical history, the funeral director is unable to proceed with cremation. Once procured this information will dictate if or when the cremation will proceed. In some jurisdictions there is a mandatory 24 to 48 hour waiting period before cremation can take place. There is no such requirement in Newfoundland and Labrador. Due to nature of the cremation process, any personal possessions or valuable materials such as jewellery which are not removed prior to cremation will be destroyed or, if not destroyed, disposed of by the crematory in a non-recoverable manner. Those families’ who would like certain personal possessions to remain with the deceased are encouraged to place them directly in the urn with the cremated remains. Most crematories require the deceased to be cremated in a combustible, leak proof, rigid, covered container, if a casket is not being used. The deceased is always cremated in the casket or container used or received by the crematory. The only exception being, when a rental casket is used. In that case the deceased will be removed and placed in a wooded or cardboard cremation container. Cremation caskets, having simple design characteristics with few metal parts, are also available. It is the preference of most crematories that the casket or container be made of wood or other combustible material. Non-combustible materials used on traditional caskets such as decorative handles or rails, latches, et cetera, which could cause damage to the cremation equipment are removed prior to cremation and destroyed or disposed of by the crematory in a non-recoverable manner. Any small metal parts such as nails, screws and staples are removed with a magnet following the cremation process. In order to cremate in a metal casket, it is necessary to remove the front cover of the casket, exposing the remains. As a metal casket will not be totally consumed, its remnants will be disposed of by the crematory. The cremation process begins with the placement of the casket or container in the cremation chamber where it is subjected to intense heat and flames reducing the human remains to bone fragments, referred to as “cremated remains”. During the cremation process, it may be necessary to open the cremation chamber and reposition the deceased in order to achieve a complete and through cremation. Every effort is made afterward to remove all the human remains; however, a small residue may remain in the cremation chamber, resulting in incidental commingling with other cremated remains. This completes the cremation process. The urn or container in which the cremated remains is placed in now ready for final committal, scattering, or can be returned to the family or kept at the funeral home for safekeeping. When an individual or family chooses cremation, certain documentation must be completed. These documents protect the crematory from liability and make clear to everyone involved the various aspects of the cremation process. Before cremation can take place approval must be granted by the chief medical examiner or coroner. A Certificate of Approval, issued by the medical examiner or coroner is usually obtained by the funeral home. A form authorizing the funeral home or crematory to cremate the deceased must also be completed and signed, in the presence of the funeral director, by the next-of-kin or deceased’s legal representative. Both the Certificate of Approval and Authorization to Cremate forms are extremely important legal documents, and funeral directors should take care to ensure that the are fully understood by the surviving family members. If cremation is to be performed outside a community by another funeral home, the local funeral director with whom the initial arrangements are made must also complete and sign a Funeral Director’s Certification Form. This form certifies that the person authorizing the cremation was fully advised of all the particulars associated with the Authorization to Cremate. The Authorization to Cremate form may consist of one page or multiple pages, depending on the amount of information a particular crematory feels the consumer should have in order to fully comprehend the procedure being authorized. The form may be supplemented with additional printed material and a verbal explanation of the various aspects of cremation. Whether or not the death resulted from infectious or contagious disease. Whether or not embalming of the deceased is required. A description of the cremation process, beginning with the placement of the casket or container in the cremation chamber, the temperature achieved, procedures followed during cremation, description of the cremated remains, their removal and final processing. An explanation that, due to the nature of the cremation process, any valuable material, including gold, will either be destroyed or not recoverable. An explanation that the deceased is always cremated in the casket or container used or received by the crematory. Most crematories require the deceased to be cremated in a combustible, leak proof, rigid, covered container, if a casket is not being used. Confirmation that the deceased did not have a heart pacemaker implanted, radiation producing implant device or any other device exist, the funeral director would be authorized to remove it. Confirmation that the deceased did not execute a consent form following his or her remains, or parts thereof to be used after death for therapeutic purposes, medical education or scientific research, or that such consent, if executed, has been acted upon. Standard indemnification clause holding the crematory, its officers and employees harmless from any liability, costs, expenses, or claims by any person arising from the matters authorized. It is important for the person authorizing the cremation to study the form or other materials that may be provided by the funeral director so that he or she fully understands the cremation process and associated procedures that lead to the placement of cremated remains in an urn or container for final disposition. It is quite often asked, “Can I authorize my own cremation?” In Canada, the answer is no. In certain U.S. states, legislation has been introduced allowing people to authorize their own cremations. Once you die, your body becomes the property of your estate. The executor, next-of-kin or legally authorized person then has the authority to choose the type of funeral service that they desire for you, if not otherwise specified. This includes cremation. If this is a source of concern, take comfort in the fact that very few people change the wishes of those who take the time to record the type of funeral services they would like, such as in a Will or Preplanning Agreement. In the absence of any of these individuals, the person who would have the legal authority to authorize cremation would have to be determined, but would usually be some other relative. In a case where the deceased left specific instructions, such as Will, the executor of that Will would have the legal authority and obligation to carry out the directions as specified. The executor would have ultimate authority, even if there were surviving next-of-kin. In cases like these, the funeral director may ask for a copy of the portion of the deceased’s Will that names the executor and verifies the documnt has been fully executed. Without an up-to-date Will or other binding documents, the line of authority may not be clear. For example, consider the death of an individual who has been separated from his wife and living with another woman for many years but has never legally divorced. The question arises as to whether the estranged wife had the authority to authorize his cremation. Add to this the emotions of the surviving children and siblings, and the determination of legal authority is not an easy task. In cases like these, the advice of a lawyer is often sought. If cremation is your final wish, or you have consented to act as executor for someone who has specified cremation, take time to learn more about what is involved along with legal responsibilities. Choosing cremation does not limit the type of funeral service one might select for themselves or a loved one. In fact, cremation affords greater options. As cremation is just one method of preparing the deceased for committal and final disposition, a cremation service need not differ from that of a traditional funeral service. Cremation does not prevent family, relatives and friends from participating in the ceremonies and services common to a traditional service. This includes the preparation and placement of the deceased in a casket for viewing. Some families who opt to cremate their deceased loved ones have expressed a reluctance to destroy a beautiful casket. For those who would prefer not to select a traditional casket with its intricate design and ornamentation, when choosing cremation, there are other product options from which to choose. Cremation caskets are simpler in design and are constructed specifically for cremation. In fact, some manufactures actually refer to them as “environmentally friendly” as they are made primarily of wood with little or no metal components. As a result they are typically less expensive than traditional caskets yet crafted with the same quality. Instead of purchasing a casket some funeral homes offer rental caskets. They look similar to a traditional casket with one small difference. The interior lining is attached with Velcro™ in order that it can be removed and destroyed after each use. After visitation or a church or chapel service, the deceased is removed from the rental casket and placed in a cremation container. This is a rigid wooden, or cardboard container with cover designed specifically for direct cremation. In addition to the interior lining, the pillow and mattress board is also removed from the rental casket and placed in the cremation unit with the deceased. 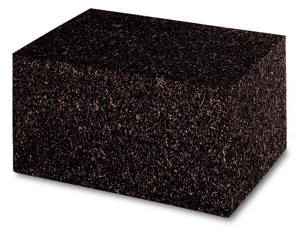 Certain rental caskets come with a removable wooden or cardboard container inside the rental unit. This container is slid out of the foot end of the rental casket without disturbing the remains. Typically alternative containers are constructed of plywood, pressboard or cardboard but are not designed to accommodate viewing. As earlier noted they are often referred to as cremation containers used specifically for direct or immediate cremation. Immediate or direct cremation is cremation without any preparation, viewing, events or ceremonies. It is simply the removal of the deceased from the place of death, placement of the remains in a cremation container followed by the commencement of the cremation process. Cremation will take place whenever it is convenient for the crematory once all authorizations have been procured. Cremation is not final disposition. After the process there is still an opportunity for the family to participate in a meaningful and personalized funeral service. This service includes a scheduled time for friends and relatives to visit the family at the funeral home to show their support and pay their respects to the deceased. Instead of seeing the remains in a casket, however, an urn containing the deceased’s cremated remains is present. Placed on a small table or pedestal the urn may be accompanied with a floral tribute and picture. Other family photos or mementoes can also be mounted on a “memory board” and/or displayed throughout the room. These displays may reflect the deceased’s life, occupation or interests. Some families choose to have visitation without the urn present while others prefer private visitation for family members and close friends. A memorial service is generally understood to be a service held in a funeral home chapel or church without the remains present. It may be religious or if the deceased did not profess a specific religious belief, secular. If friends or relatives are located in a different part of the country and are unable to travel to one location, more than one memorial service may be held. Also, it is not uncommon to have a memorial service with the urn present. Again, the urn with flowers is displayed on a table in front of the chancel steps. It is then removed at the end of the service by the funeral director either, formally in the presence of the congregation or informally after the church has emptied. When a memorial service is held without a period of visitation some funeral homes provide a guest book at the back of the church or chapel to record the signatures of those in attendance. The book is then given to the family. Even when there is no longer room for a casket interment, an existing family plot can accommodate the interment of several urns. The number, which can be accommodated will usually depend on the size of existing monuments or markers. A standard urn plot measures 2’x2’x2′. Therefore, a single grave should be able to accommodate a minimum of three urns. For those who prefer traditional in-ground interment of cremated remains, but do not have or wish to use a family plot, many cemeteries have urn plots or areas set aside for this purpose. Sometimes these areas have been designed around a sculpture or garden feature. Each urn plot can accommodate the interment of at least two urns. The scattering of cremated remains is permitted in Newfoundland & Labrador and although there is no specific legislation in the province governing this practice it is assumed that permission of the landowner should first be sought if scattering is desired on private property. Permission is not required to scatter cremated remains on crown land. In most parts of Canada cremated remains may be scattered in cemetery gardens or memorial scattering areas especially created and dedicated for this purpose. The use of dedicated property assures the site chosen will not be developed for other purposes at some future time. Memorial scattering areas range from natural settings to formal gardens. Often, the individuals whose cremated remains have been scattered in such an area are identified on a special memorial plaque, or a unique garden feature such as a sculpture on which the individual’s name is inscribed. For more information about scattering go to the Help and Support section and click on “Scattering Options”. 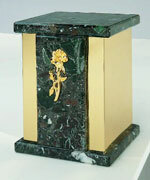 A popular choice for the placement of an urn is in an indoor or outdoor columbarium niche. A niche is a recessed compartment designed for the permanent placement of urns. An arrangement of niches is called a columbarium. Cemeteries usually offer a wide variety of columbaria from which to choose. Some are free-standing structures located outdoors in picturesque settings. Others are located indoors in either a chapel or mausoleum. Depending on the location of the niche, it may have an open front protected by glass where the urn remains visible, or a closed front faced with wood, bronze, granite or marble where an inscription is placed on the niche front. A vase may be placed on some closed front niches for the placement of flowers by those who care to commemorate special occasions. There is a columbarium located in the Anglican Cemetery in St. John’s. For more information about exterior columbaria in Newfoundland and Labrador go to the Help and Support section and Click on “Newfoundland’s First Exterior Columbarium”. With the significant increase in the growth of cremation many Christian faiths have revised their funeral and burial rites and rituals to accommodate the various options associated with the cremation process. In cases where the deceased is of the Anglican faith it is the church’s policy to have a short committal service, often referred to as the “Committal to Flame”, at the crematory prior to cremation. Immediate family members are welcome to attend; otherwise, the service will proceed with the clergy and funeral director. The United Church will also conduct a similar committal service at the crematory if requested by the family. Both faiths have revised or written liturgy to accommodate this ritual. As yet it is not offered by other Christian faiths. Through the centuries, the Catholic Church has followed the practice of burial or entombment, similar to Christ’s own burial, out of respect for the human body in the Resurrection. Although cremation is now permitted, it is the Church’s preference that this traditional practice be maintained. Furthermore, the church prefers that the body of the deceased is present for its funeral rites. The preference that the body be present for its funeral rites is reflected in the Order of Christian Funerals, which contains provisions for the cremation of the deceased at the conclusion of the funeral liturgy before the Rite of Committal. Therefore, in accordance to contemporary Catholic teaching and practice, a funeral service for a Catholic consists in bringing the body of the deceased to the church for celebration of the Funeral Mass and the interment in consecrated ground of a Catholic cemetery, whenever one is available. It is not always possible for the body to be present for the funeral liturgy. Economic, geographic, cultural and family circumstances on occasion make the cremation of the deceased the only feasible choice. Under circumstances such as these, the Catholic Church considers it appropriate for the cremated remains to be present for the full funeral rites, including the Vigil for the Deceased, Funeral Liturgy and Rite of Committal. Generally, when present in the church, the cremated remains are placed on a small table in front of the altar before the Liturgy. After the people have assembled, the Funeral Mass is celebrated with some minor changes in prayers and in the rituals. Signs of reverence such as the sprinkling of the holy water and incensing the cremated remains may be used. Following the services the cremated remains should be reverently buried or entombed in a Catholic cemetery, columbarium or mausoleum. The practices of scattering cremated remains at sea, from the air or the ground or keeping the cremated remains at home is not considered appropriate by the Church. Some form of memorialization such as a plaque or headstone that records the name of the deceased is encouraged. This coincides with the teachings of other Christian faiths, which specify that burial of cremated remains in consecrated ground should be the first option. Most clergy will not insist upon this rule and are often called upon to make compromises. One such compromise is the separation of the cremated remains into two or more containers with one being buried, and the contents of the other scattered. Quite often individuals who wish to be cremated ensure their final wishes are well known, either by preplanning, including instructions in their Will or telling a spouse or child. Rarely is a loved one’s wishes revised or ignored. This is particularly true when direct cremation is chosen, as evidenced by the phrase “at (name of deceased) request cremation has taken place” which often appears in the funeral notice. Because there are many different options from which to choose, the choice to cremate to reduce is perceived to be less expensive. Because of this, some people will choose cremation to reduce the financial burden on family members. The premise that cremation is less expensive may not always be true, especially when cremation follows a traditional service with viewing and visitation. However, considerable savings can be realized with direct or immediate cremation followed by a memorial service and scattering. The latter alternative eliminates the need to purchase a casket, cemetery plot and other funeral and burial services. Increasingly, people are making choices or decisions with the environment in mind. For them, cremation becomes the perfect alternative. It uses less land, it is cleaner and protects our forests, when a rental casket or direct cremation is chosen. Manufactures are also developing new environmental products such as cremation caskets and containers built with composite materials and fewer metal parts, making the cremation more efficient while burning less fuel. For some, cremation is perceived to be simpler, less emotional and more convenient. The elimination of the preparation and viewing of the deceased and placing an urn in a reposing room during visitation will certainly ease the emotions an open casket will evoke. An urn is much easier and more convenient to handle than a casket and can be stored for many months while awaiting final disposition. Although scattering is an irreversible act, it provides for the disposition of the cremated remains in a non-traditional way. In choosing a scattering location, the deceased or family will usually select a place where the deceased spent a great deal of time or was a source of enjoyment or happy memories. A favorite fishing hole, a garden or walking trail or at sea are just some of the many places chosen. For some, scattering becomes a symbol of freedom, peace, adventure, contentment or simply a rite of passage. Even in death people’s fears or phobias emerge. For some the thought of having their body buried or entombed is unbearable. Cremation then becomes a welcome alternative. There are countries in the world such as Japan and India whose people practice cremation as a religious custom. There are religions, which strictly forbid it. For Christians cremation is permitted and some churches have even designed liturgy to accommodate the practice during the funeral and committal services. While most people do not mind their remains being viewed or placed on display, others are adamantly opposed. Again cremation becomes a viable alternative with the urn placed in the reposing room during visitation and transferred to the church or chapel for the funeral services. During a committal service at graveside the clergy will say “… and we commit the body to the ground, earth to earth, ashes to ashes, dust to dust”. It is a Christian’s belief that our earthly remains will go back to the earth from whence it came. Therefore, cremation is considered by some to be more a “natural” process as the deterioration of the remains is quickened by the intense heat of the retort. The cremation rate in North America is increasing annually. The Cremation Association of North America (CANA) projects the Canadian cremation rate is expected to reach over 47 per cent by 2010. In the U.S. a rate of just over 36% is predicted by 2010, and if current rate increases continue, a rate of 50 per cent will be reached by 2021. CANA’s statisticians believe that once a country exceeds a 75 per cent cremation rate, it will conform to historical trends, which indicate there will be little if any increases in future years. Except for Japan and India, no country has cremated more than 76 per cent of its deceased citizens. As defined in Webster’s English Dictionary Concise Edition, ” An urn is a receptacle for preserving the ashes of the dead”. There are literally hundreds of different types of cremation urns available. They are made from a wide variety of materials in many colors, shapes and sizes. Depending on their desired use, some urns are more suitable than others. For example, metal urns such as bronze or pewter or marble urns are more suitable for earth burial than urns of porcelain or wood. The following are some of the materials and procedures used to manufacture many of the urns currently available in funeral homes throughout the country. Modern bronze is a combination of copper, zinc, and tin. It is formed in three basic ways. It can be rolled into sheets, or cast into shapes using either the “lost wax” or sand casting methods. Urns made from sheet bronze are normally shaped into squares and rectangles. Intricate castings use the “lost wax” method. Designs to be cast into metal are first sculpted in wax, which is covered with fireproof molding materials. It is then heated until the wax can be removed leaving a cavity into which the molten bronze is poured. For urns with less detail, a likeness of the urn is made in wood or metal. This “pattern” is then pressed into two beds of fine, damp sand. The beds are then matched and locked together to form one mould. Molten bronze is then poured into the mould and the sand discarded after the metal has cooled. Any roughness in the final finish is removed by sandblasting. Hardwoods often used for urns include oak, maple, cherry and walnut. The distinctive grain pattern of hardwood makes each urn unique. The warmth of wood is enhanced by either a gloss or satin finish. Because of its distinctive variegated patterning, each marble urn is unique in appearance. The intricate natural designs of the various elements within the original stone are enhanced by its highly polished surface. Cultured marble is a second type of stone urn. It is produced from limestone chips, which have been mixed with an adhesive and colouring, then cold formed and polished. The Chinese first made porcelain in the sixth century. The main ingredients include fine white clay, ground glass particles and powered animal bones. Baking at extremely high temperatures produces the hard, almost translucent material known as porcelain. The colourful decorations are achieved by painting the finished product with brilliant, which melts the glass particles in the paint, producing the hard, durable surface. Cold casting bronze involves filling a mould with a mixture of bronze powder and a small amount of resin. No heat is required as the mixture cures at room temperature. When the urn is removed from the mould it is hand polished to remove any slight imperfections and to create the gloss, which makes bronze so attractive. A clear coating may also be applied to protect the surface. Cloisonné is an enameling technique developed in the 12th century. On a solid bronze casting delicate metal strips are raised in relief to form the pattern. Each resulting cellular space is filled with glasslike enamel. The urn is then fired and polished, revealing intricate detail in bright, vivid colours. Glass was discovered during the time of the Phoenicians. Made from silica, lime and flux, today’s artists fuse the glass at temperatures above 2100°F and then use a blowpipe to expertly shape each piece. From this ancient tradition of glass working, elegantly shaped and polished urns are crafted in a variety of unique styles and colours. Whether they are buried, or placed in a columbarium, glass urns will retain their appearance for centuries to come. With few exceptions, any urn can be personalized, including both round and flat surfaces in a variety of materials, including bronze, stainless steel, marble, hardwood and glass.Personalizing an urn may include engraving photos, emblems and personal information on its surface. A number of standard illustrations can be laser-engraved on urns, or a custom design service will engrave black and white art on the urn, based on a photo provided by the family. Insignias and emblems representing fraternal interests are also available. Bronze appliqués such as a cross, angel, rose or flowers can be attached to the surface of an urn. Brass plaques engraved with the deceased’s name and age are also used. Keepsake urns, designed as exact miniatures of the larger urns, are used to hold a small portion of the cremated remains or simply to serve as a memento. 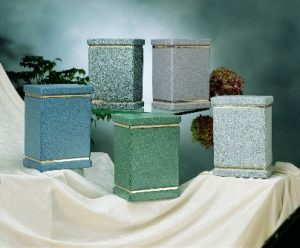 These urns vary in size but usually do not exceed 5 inches in height and are crafted in most of the materials mentioned. When choosing to scatter, the selection of the right urn is important. Those made of bronze, marble and ceramic can be extremely heavy and cumbersome. There are urns designed for the easy removal of the cremated remains. They are lightweight and usually made of plastic or thin sheet metal. Each open from the top allowing the cremated remains to be poured out in a dignified manner. Once used, some of these urns may be discarded, while others may be used as a vase or keepsake container. There have been many reported cases in North America where the wrong person has been cremated. Mistakes have originated in hospitals where the wrong body is released to the funeral director or mix-ups occurring in funeral homes, particularly in larger establishments that are handling multiple deaths on a daily basis. Regardless of how it happens, the standard of care in many funeral homes is to have the body positively identified by a family member or authorized party familiar with the deceased prior to cremation. If identification is not suggested by the funeral director, there is nothing stopping the family from requesting it. In Canada and most U.S. states you are not permitted to authorize your own cremation. The legal right to do so rests with your next-of-kin, or if you have completed a Will, your Executor or legal representative. Although this appears to be straightforward, complications can arise. When someone signs the cremation authorization form, the funeral director must verify the person’s identity and his or her authority to authorize the cremation. Generally, when funeral directors are dealing with someone they do not know, they will obtain confirmation of identity, such as, driver’s license or passport. If a person indicates he or she is the executor, the director may also request a copy of the first and last pages of the deceased’s Last Will and Testament. This will verify the name of the executor and that the Will has been duly executed. As previously noted, without an up-to-date Will the immediate next-of-kin will assume responsibility. Legally the next-of-kin who qualify are listed according to priority. The first level is the spouse, followed by an adult child or children of the deceased, then parents, siblings, etc. When authorization rests with the deceased’s adult children, conflict can occur if one or more of them do not agree with the wishes of the other siblings. Legally, regardless of who is the oldest, each adult child has equal status. When dealing with multiple members of the same class, the funeral director must get permission from all members of that class. In the case of the adult children, this would require their signatures on the authorization form or a faxed copy. If a signature cannot be obtained, a verbal authorization is acceptable. Cremation performed without proper authorization or on the basis of misrepresentations made by the authorizing party may result in serious legal problems for the crematory. A funeral home and crematory’s responsibility does not end with the signing of the cremation authorization form. It is just as important for the authorizing party to understand exactly what is going to take place in the cremation process. The director should review the contents of the authorization form in detail, explain the step-by-step procedures and point out what the family should expect to receive at the end of the process. Simply getting a signature does not release the crematory from its responsibility of ensuring the authorizing party is fully informed. Due to the nature of the cremation process, any personal possessions or valuables, such as, jewelry or other memorablilia will be destroyed or, if not destroyed, disposed of by the crematory in a non-recoverable manner. To avoid any miscommunication, directors will usually get explicit written instructions from the authorizing party pertaining to what articles should be removed from the deceased, where they should go or to whom they should be returned. Those families who would like certain personal possessions to remain with the deceased are encouraged to place them directly in the urn with the cremated remains. Heart pacemakers, or other mechanical, prosthetic or radioactive devices can explode during cremation causing significant damage to the crematorium and injury to staff. To prevent this from happening, the funeral director will determine if the deceased had any of these surgical implants and get permission from the authorizing party to remove them. Pacemakers may be reused and are usually returned to the hospital by the funeral director. Commingling is defined as the mixing together of two or more cremated remains. When a body is cremated the residue left behind includes the ashes of the receptacle in which the body is cremated and the deceased’s bone fragments. Both the ashes and the bone fragments are removed from the concrete floor of the retort with a rake that has stiff metal bristles. The materials are raked into a metal pan and the bone fragments are then removed by hand and placed in a mechanical processor for further reduction in size. The ashes and any other foreign residue are then disposed of by the crematory. Due to the extreme heat generated during the cremation process, the concrete floor and ceiling of the retort, along with the refractory brick forming the sides of the chamber are susceptible to cracking. Because of these cracks it is impossible for the crematory to remove all of the cremated remains as minute particles become trapped between the cracks. To avoid any misunderstanding, family members should be made aware that they will not receive 100 per cent of the cremated remains of their loved one since some will be unrecoverable. After each cremation crematory personnel clean out the retort by thoroughly vacuuming the floor and sides of the chamber. By doing so this ensures that the cremated remains of different individuals are not commingled. Therefore, it is equally important that the family also understands the efforts made by the crematory to prevent commingling. A more serious form of commingling occurs when more than one body is cremated at the same time. Unless specifically sanctioned by a regulatory agency, this practice is strictly prohibited. If undertaken it could result in disciplinary action including fines and loss of license by the regulator and/or legal action against the funeral home/crematory by the families of the families of the decedents. The amount of cremated remains returned to a family will depend on the skeletal stature of the deceased. As a rule of thumb, the larger the skeletal stature, the greater the quantity of cremated remains generated. It is therefore, important for funeral homes to have a wide variety of urns with varying capacities from which to choose. Regrettably, there are occasions when the urn selected cannot hold all of the deceased’s cremated remains. Rather than disposing of the surplus, the additional cremated remains should be placed in a second urn. A plastic utility urn is usually used for this purpose and is provided at no charge. A detailed explanation of why a second urn is required should also be provided to the family. Failure to return all the cremated remains is very unsettling for a family and has been the source of complaints filed with regulatory authorities and lawsuits. In addition to confirming the identity of the deceased prior to cremation, it is equally important to establish an identification procedure throughout the cremation process. If a body is to be delivered to a crematory, the standard procedure is to attach a durable, non-corroding identification tag to the wrist or ankle. At the crematory the I.D. tag is removed and when the cremated remains is recovered, the tag is put inside the urn or container that holds the cremated remains. Funeral homes performing their own cremations use a similar procedure. In this case a metal disk that has been stamped with an identification number and the name of the deceased is recorded in a permanent register. Again, when the cremated remains are recovered, the metal disk is place in the urn or container. Identification information is also placed on the outside of the urn or container. Brass nameplates engraved with the name and age of the deceased is usually attached to the urn or the urn itself is personalized with laser etchings, the deceased’s name, etc. Cardboard and plastic urns, which are used for transportation and then discarded, also have ID labels attached to the bottom of the container. The importance of having explicit written instructions when cremation is involved cannot be overstated. In order to determine what should happen to the cremated remains, many funeral directors record the authorizing representative’s wishes on an “Instructions For Disposition” form. The form identifies where and when the cremated remains are to interred; if scattering is to take place, to whom they should be released or if they are to be shipped, to whom, and how they should be sent. Should something go wrong and the cremated remains are lost by the carrier or recipient, the funeral home and/or crematory will be held harmless from any liability if the instructions were followed as documented. One of the biggest problems funeral homes face is what to do with unclaimed cremated remains. For more information about unclaimed remains, please click here. Throughout the U.S. and Canada there is a backlog of cremated remains, some dating back over 20 years that have simply been left in the funeral home and never picked up. Although many funeral homes stipulate on their documentation that they will be authorized to permanently dispose of unclaimed cremated remains in common ground if they are not advised within a prescribed time frame (usually 60 days) as to their permanent safekeeping or memorialization, they are reluctant to do so rather than face possible litigation for wrongful disposition. Many jurisdictions have begun to address this matter and are now allowing funeral homes to properly dispose of the cremated remains after a defined time period. Others are authorizing the release of the cremated remains to a neutral party, such as a coroner or medical examiner for disposition. The above information has highlighted a number of things that can go wrong when cremation takes place. Whether it is the identification of the deceased or the cremated remains, the procurement of personal possessions or the final disposition of unclaimed remains, it is incumbent upon the authorizing representative to understand the process and its various components and the funeral director to fully inform those involved and establish a standard of care that is comforting and reassuring for the family.